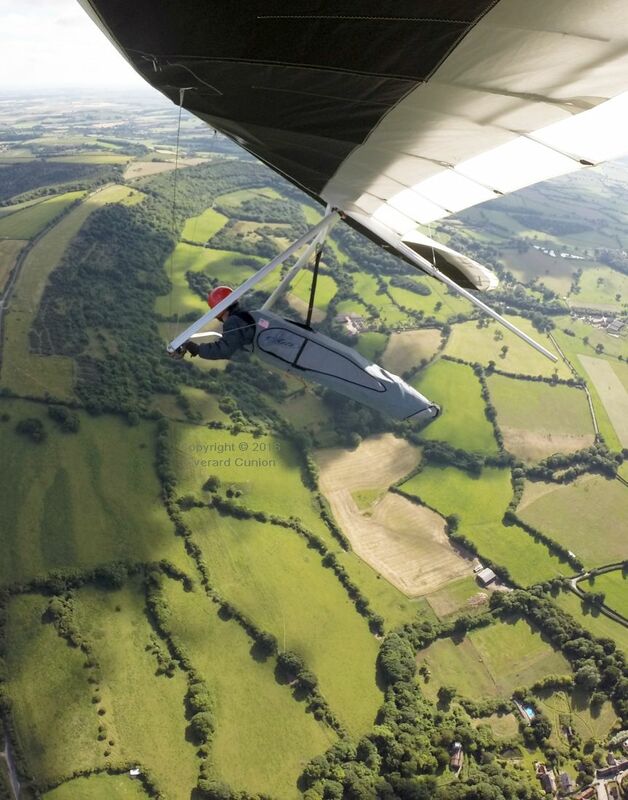 This page continues from Hang gliding 2016 part 1. 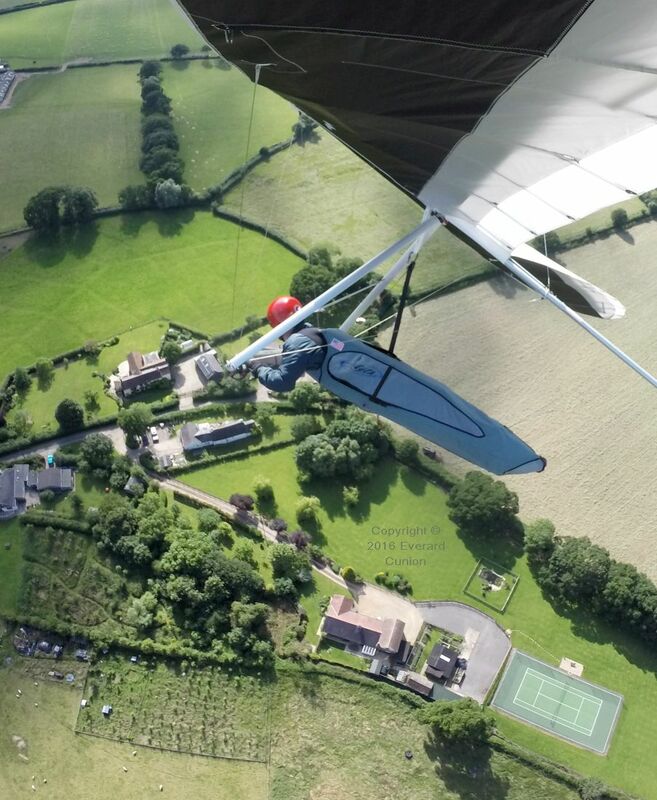 Thermal lift and a light wind produced challenging but potentially rewarding conditions on this day at Bell Hill. 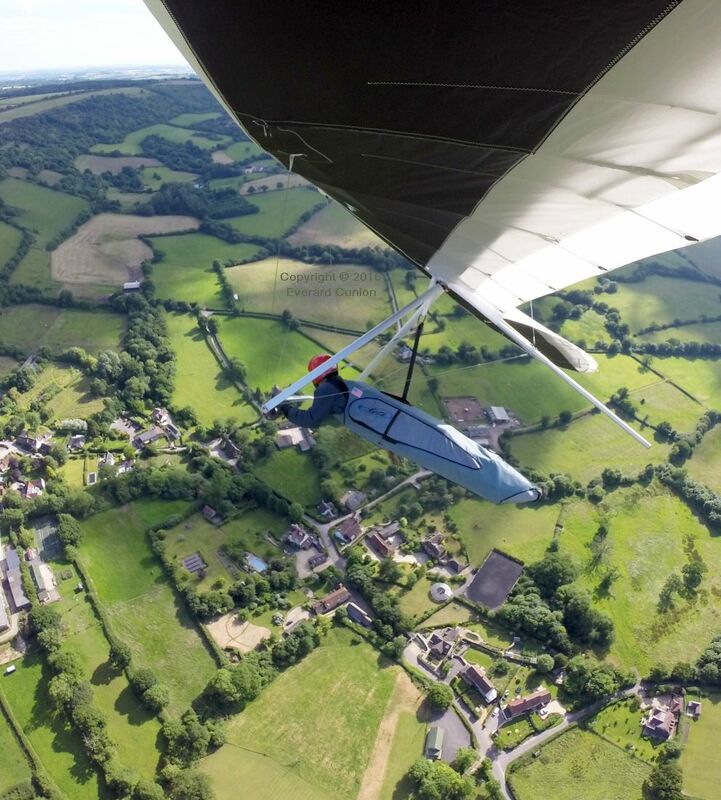 While I rigged my wing, a white and green Avian Rio 2 climbed in a thermal out in front of the hill to well over 1 000 ft above launch. When I had finished rigging, he sunk out to the bottom landing field. Nevertheless, when I was ready to fly, paragliders marked lifting air. 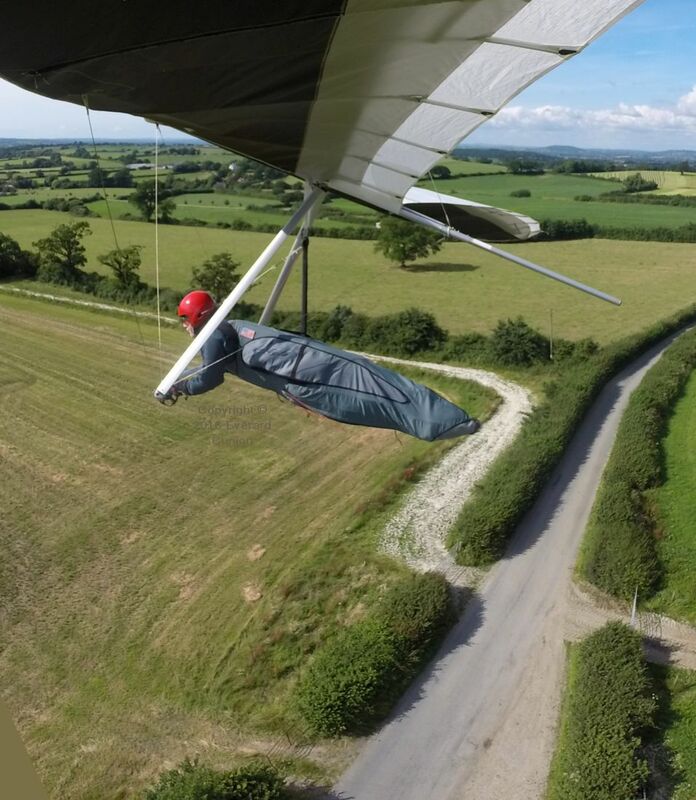 Although the wind at launch was not strong enough to lift the weight of my hang glider while I stood on the hill holding it (normally a bad sign) I took off and went up in turbulent lift. The following four photos I think illustrate why an audio variometer is essential for thermal flying. (It emits beeps when you are rising and a low growl when you are in sinking air.) A few pilots prefer the challenge of going without such gizmos, but I do not believe that it is possible to detect weak lift without a vario. The full 360 degree turn took exactly 15 seconds (my camera was taking one photo every five seconds) and the height I had gained is hard to discern visually. Nevertheless, my variometer was beeping, so I knew I was climbing. 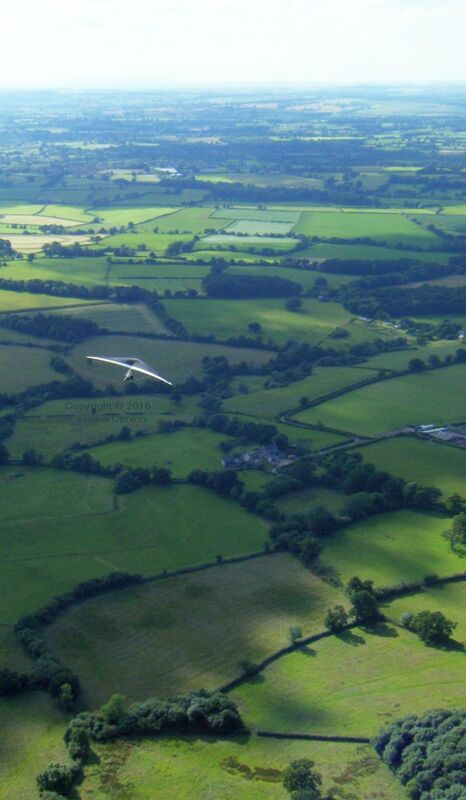 Over the village of Ibberton, I spotted rising specks up-wind. 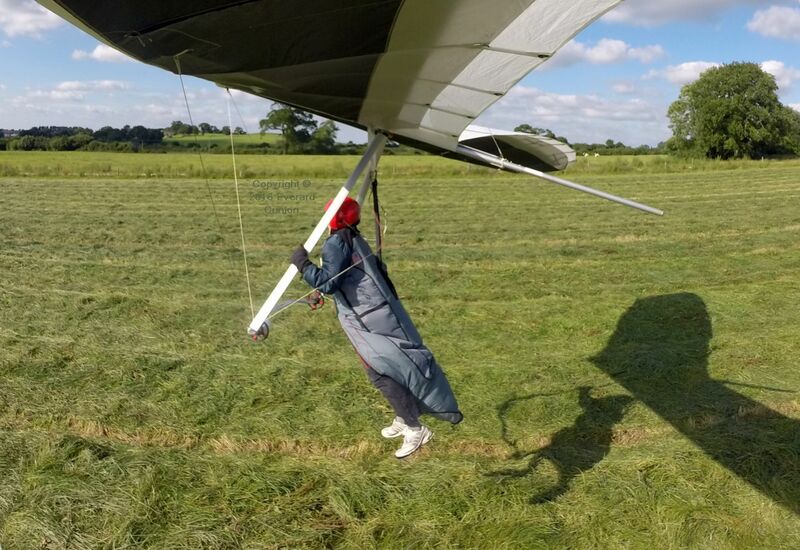 They were three paragiders that had launched in a lull before I did. (The wind on the hill was occasionally too strong for safe paraglider operation.) I flew towards them and encountered weak but widespread lift, which was thankfully without the turbulence I met when flying near the hill. 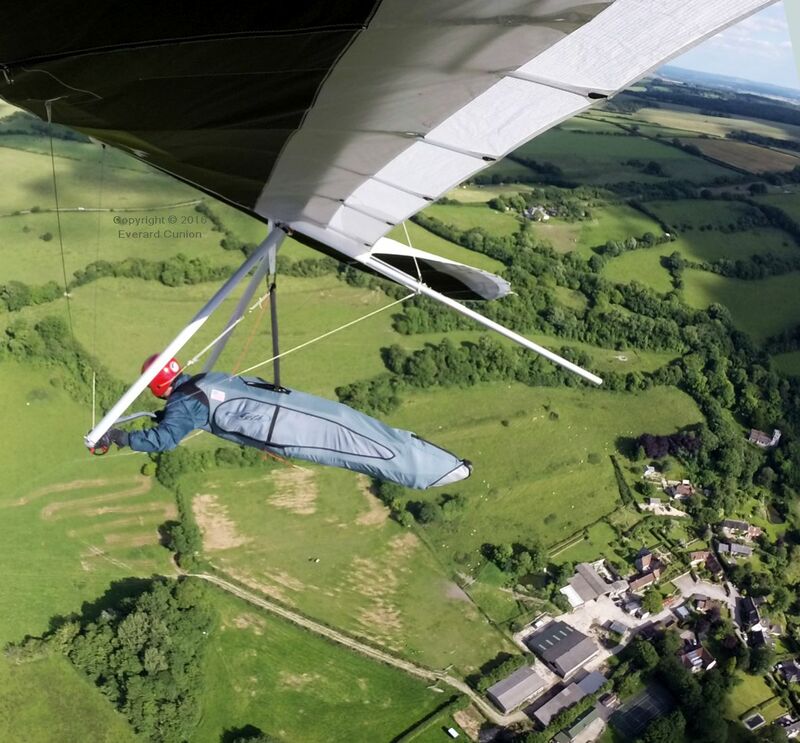 The pilot of one of the pathfinder paragliders took these two photos of me using a hand held camera. 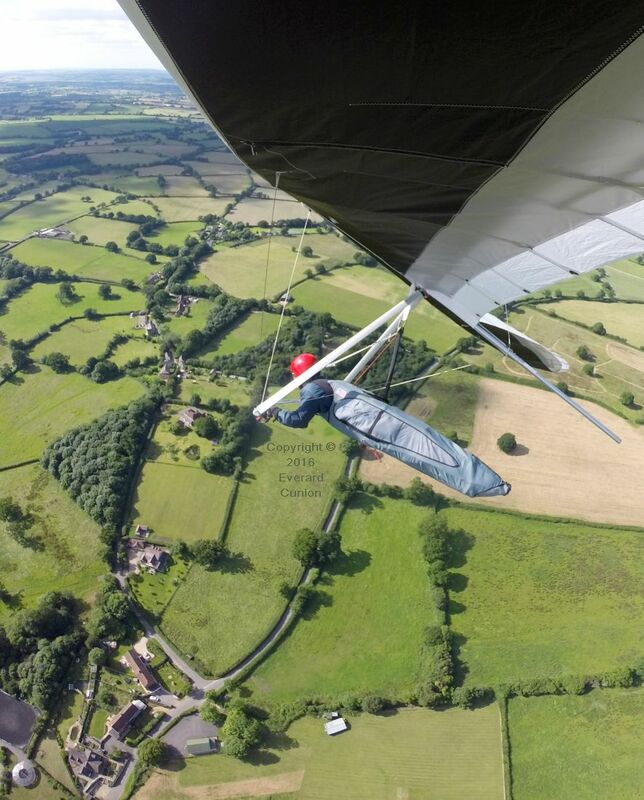 In this photo, two of the paragliders circling with me can be seen behind my starboard tip. Bell Hill, from where we launched, is in front of my head, with the track up it at an angle, ending where our vehicles are parked. The white blobs in the big field on the top of the hill are pig pens. That used to be our landing field. 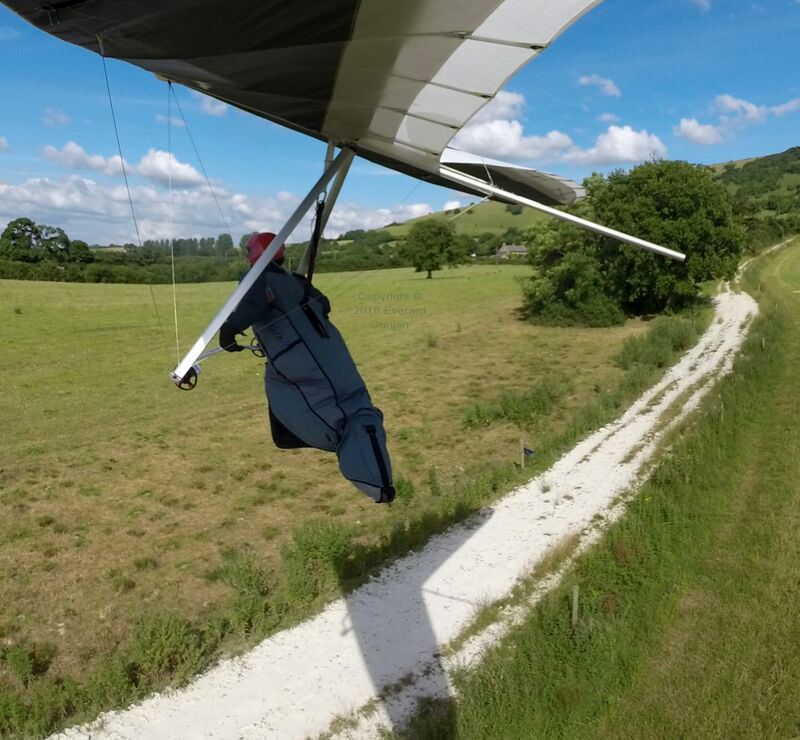 Earlier in the day, another hang glider pilot drove down to investigate the bottom landing field, which had a crop of tall grass or similar. The farmer was there and he then used his tractor to cut it for us! On this day in mid July at Bell Hill, conditions were best during the more ‘active’ part of the day in early afternoon. At least one paraglider made it all the way along the ridge to the tall masts and back. The pilot reported that he encountered the roughest conditions when he returned to the hill. I waited until late afternoon before I launched. The lift was weak, it was turbulent and the ridge was crowded with other wings, so I landed after fifteen minutes. 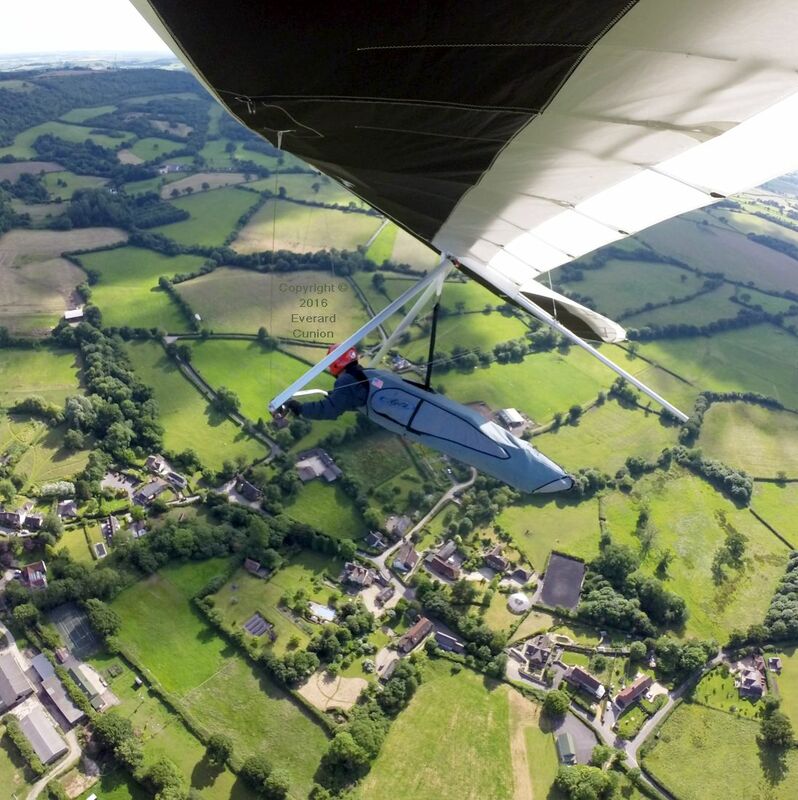 On final approach, I encountered severe sink when behind the power lines and road, so I went back into the prone position and increased speed. Although the power lines are largely invisible in this photo, a pole stands in the corner of the field. The power lines — three of them — run parallel to the hedge and road with its two gates directly below. It would not come down. 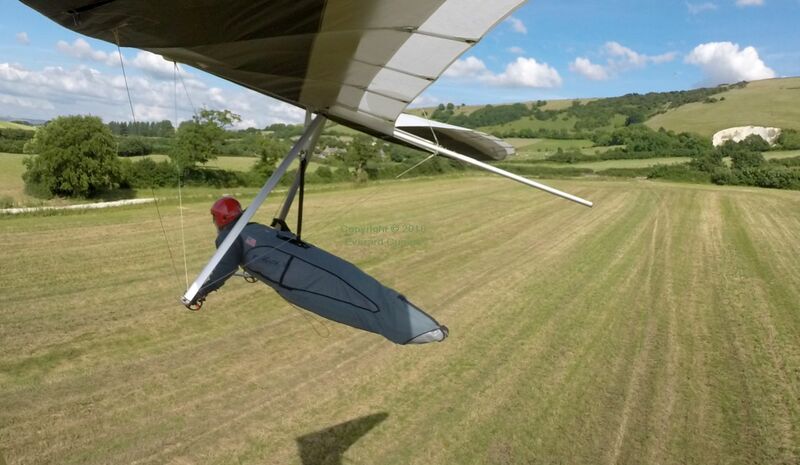 Five seconds later, over the track, I am upright again for maximum drag and my left hand is reaching for the down-tube in preparation for the round out and flare.